I've been eating a lot of salads lately. I think maybe the salad boredom is because they all end up tasting very similar...greens, veggies, maybe some fruit, perhaps some cheese and dressing. But I like this salad because it's a little different. It's actually more like a slaw than a salad, but it can work either way. I love the crunch you get from the jicama...similar to a crisp apple. It's great on its own, or alongside Mexican food. Jicama is a type of tuber, but it's actually in the legume family. It's also known as a Mexican Yam or Mexican Turnip or Yam Bean. It sort of looks like a giant turnip. You can either peel or...I think easier...trim away the skin with a knife. This salad comes together in a snap...oranges, onion, carrot and fresh herbs with some freshly squeezed lime juice. (Also, please pretend there is an avocado in that photo...and some nuts. I totally forgot to put them on the cutting board). I used the julienne setting on my mandoline to slice up the jicama and carrot, but you could also do it with a knife. As for the dressing, I just whisked together about 1/3 cup of fresh lime juice (about 2 limes), along with some olive oil and a little sugar, salt, cayenne and chile pepper. Combine everything and lightly toss with the dressing. (Or, if you are serving on individual plates, you could wait and top each salad with a little avocado and nuts). I think it tastes better if it sits in the dressing for at least 30 minutes. The great thing about jicama is that it won't oxidize, so you could even make this a day ahead of time and it would be OK. (I would just wait on the avocado until you're ready to serve). OR...it would be great as leftovers too. 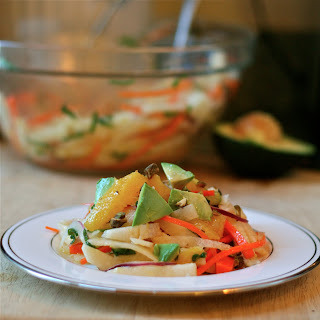 I love how the crunch from the jicama and carrot balance out with the creamy avocado and the tangy lime juice. Fresh herbs are also key here. I used mint, but cilantro would also be terrific. I wanted pepitas but forgot to get them at the store, so I used toasted pistachios instead because I had them on hand. Also, I think grapefruit would be fabulous as well, but again...I had oranges on hand already. Basically what I'm trying to say is...it can be very versatile and you can customize to your own personal taste. What other ways do you like to change up your salad routine? Whisk together lime juice, olive oil, sugar, salt, cayenne and chile powder. Drizzle over salad and toss lightly. Allow to stand for at least 30 minute and serve. Looks really yummy Jaime, can't wait to make this!